Small group tour of Pompei/Amalfi coast perfect tour!! Guides excellent -so worth it having a small group. Day was long, but well spent and planned out perfectly with adequate time in each spot. Would definitely recommend this tour!! This tour was a nice ride with a great guide. Beautiful cliff side views of the Amalfi Coast. The Pompeii portions of the tour was a different guide who was also a great guide, but there could have been a lot less explanation and standing in one spot. Tour was longer than necessary. Adrienne and our tour guide in Pompeii (I believe her name was Giovanna) were both very knowledgeable and provided great information about three cities. Adrienne also provided other locations of interest in Rome. I would highly recommend both! We are so happy that we booked this tour! Our tour guide Melissa was outstanding. Palo was our guide during the ruins of Pompeii and he was also very knowledgeable of the history of Pompeii. He gave us a great tour around the ruins, making sure we saw the best sights. 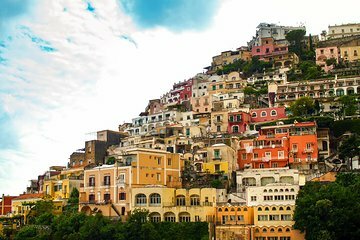 We loved visiting Positano and the drive down the Amalfi Coast. It is a crazy drive so we were happy to be on a tour rather than driving ourselves. Thank you for a wonderful day!! Thank you Viatour, this was a life changing experience. It was so well organized and structured. The bus driver and guide were so accommodating. The tour through Pompeii was awe inspiring. It was a small group so we were really up close and personal with the city. Our guide was fantastic. The drive up the Amalfi coast was totally worth the trip not to mention the great food in Positano! This tour was very informative.There was a lot of information. Since the journey was long, we were able to stop in between with clean bathrooms. We went to Positano also and had time to look around. Pompeii was amazing and I am 100% happy with that. Pavel, our guide, was great and lots of fun. The guide in Pompeii was very knowledgeable. The only reason that I did not give 5 stars was that the steps in Positano nearly killed me. If I had known there was no way up except climbing, I (at 72) probably would not have gone down them to eat lunch. On the plus side, I definitely worked off my lunch calories! have been time much better spent. That being said, the tour of Pompeii was the true highlight! Our guide there was very knowledgeable and made the ancient city come to life.